Honorable Prime Minister, Prof. Neil Gershenfeld, Dashoes, distinguished fabbers from Bhutan and from around the world, ladies and gentlemen. I recognize their four-year long history of getting it realized, and therefore I would like to extend my full respect to the dedicated efforts made by all the stakeholders involved in this preparation process. I also recognize the contributions by Prof. Tomoaki Watanabe and Mr. Yutaka Tokushima of Keio University, Japan, who visited Bhutan and conducted the preliminary assessment on the financial sustainability of the Fab Lab Bhutan. Since the very first day of my arrival in Bhutan as JICA Chief Representative in April 2016, it has been my dream to have at least one Fab Lab in the country before I complete my assignment and leave Bhutan. 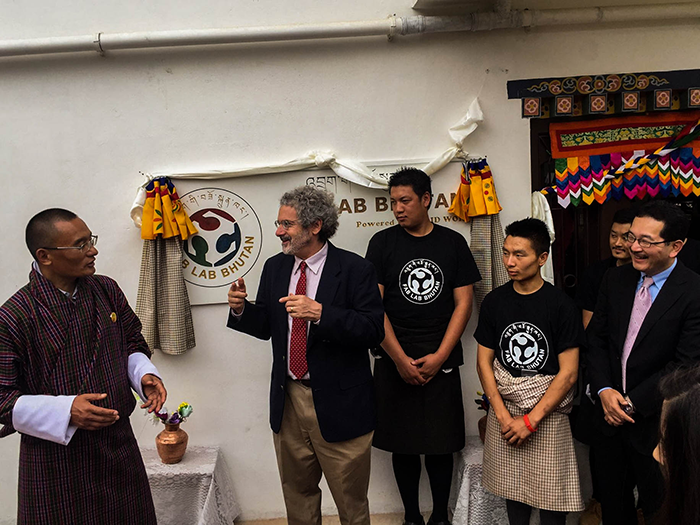 I had heard about the Fab Lab Bhutan before I left Japan, and I was lucky enough to be connected to the Bhutanese youths, especially Mr. Tsewang Lhendup, who enthusiastically spoke to me about Fab Lab, immediately after I arrived in Bhutan. I still remember clearly the day I first came to know about Fab Lab in October 2013, when Prof. Hiroya Tanaka of Keio University, visited the JICA Head Office and made a presentation to the JICA staff, including myself, about Fab Lab and the international fab conference in Yokohama. I learned that it would have huge potential to facilitate the development works JICA has been undertaking. Here in Bhutan, we have more than 70 JICA expatriates constantly, including Japanese volunteers, consultants and experts, as well as Bhutanese staff and local entrepreneurs, working for the development of a variety of sectors. When I talked to them about Fab Lab, many of them asked if they could make this or that, with the help of the facility equipped with a variety of machines. Today I have been accompanied by the two JICA volunteers who are instructors at the Technical Training Institutes in Chumey and Kuruthang. They are the first Japanese youths who expressed their interest in the lab facility here. I would like to bring it to your kind attention that they have currently been working on prototyping the heat pressing machine, communicating with another JICA volunteer who is with the Fab Lab Bohol in the Philippines. If it is successful, their heat pressing machine will be displayed at the 30th anniversary celebration of the JOCV program for Bhutan, which is scheduled in 2018. 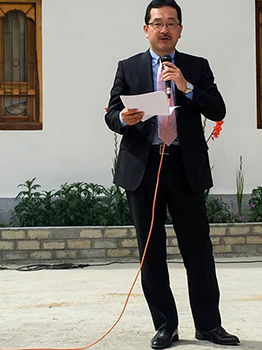 Also, through the JICA program of community entrepreneurial capacity and rural enterprise development with the Department of Cottage and Small Industries, we have a wide human network with the small rural entrepreneurs in Thimphu, Paro and Haa. Many of them are eager to enhance their products and production processes, with the help of the machines installed at the Lab. I would like to declare herewith that these JICA fraternities could be a user of the new Fab Lab and prototype the things they want, bearing fair tariffs incurred to the use of the facility. In this way, we would like to contribute to creating awareness and demand on the services that the Fab Lab Bhutan could offer. It may be too early to speak about the next step before the first Fab Lab in Bhutan proves itself to be run in the sustainable manner. Yet I’m still feeling obliged to emphasize that it’s a great first step toward creating and cherishing makers’ ecosystem or culture of self-sufficiency across the whole country. 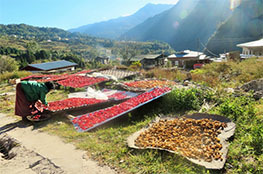 For Bhutan to achieve self-sufficiency and self-reliance, we need to have the similar enabling environment at different parts of the country, so that many citizen users could take easy access and make their customized products locally, instead of importing the equivalent foreign products, or just doing nothing. Last year, in the November 5th issue of the Kuensel, I wrote an essay titled “Let’s make Bhutan a Fab Country” in order to share my view with the readers. I understand that the new Fab Lab here is closely linked to the promotion of the Fab City concept in Thimphu, but I would like to see it scaled up nationwide so that the whole country has the fab ecosystem. Currently we have been working on the JICA project for formulation of comprehensive national development plan for Bhutan toward 2030, with the GNHC; Ministries of Works and Human Settlement, Home and Cultural Affairs, Agriculture and Forests, Economic Affairs; National Land Commission; and National Environment Commission. By formulating the national land use plan in the participatory manner, the project aims at curbing or even reversing the rural-urban migration and promoting regionally balanced development. But it’s still difficult for the comprehensive land use plan and implementation alone to control the direction and volume of in-country migration. We need to come up with the institutional arrangement which is complementary to the physical infrastructure services, in order to attract the youths at different places of interest inside the country, if possible, in rural areas. In another essay in April this year, I urged that we should create among the rural youths a strong sense of belonging to the community they live in. If they feel they are skillful enough and needed by the community as a resourceful person, they may choose to remain while they could still feel the happiness of living in rural area. I got this implication from my visit to the Vigyan Ashram in India. I would like to thank the valuable insights of Dr. Yogesh Kulkarni, Director of the Vigyan Ashram. Maybe I have spoken too much on the long-term vision. Let’s get back to where we are now. No matter whether it is about Fab City or about Fab Country, the future of the makers’ ecosystem in Bhutan rests on the shoulders of the first Fab Lab in Thimphu. Long-term economic success turns on harnessing the full creative potential of each and every human being. Fab Lab in Thimphu could stimulate the creativity that all of us potentially have, and it could ultimately shape the capital city to emerge as the core and engine for long-term economic growth. The Fab Lab will help the creative 30 percent to be more creative, but it could also unleash the creative potential of the remaining 70 percent of the population that currently lies outside the creative class. In my understanding, Fab Lab aims at facilitating the self-help efforts of the citizen users to make the new products or the products that didn’t exist before, by themselves. 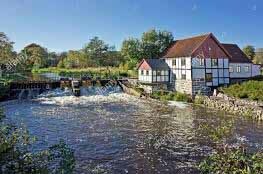 But it also aims at promoting the sharing of the tools, products and ideas with others if they are already there. This means that Fab Lab also aims at facilitating their self-help efforts to make the products they want with the help of others. In other words, there are built-in mechanisms in the Fab Lab set-up that could reduce the psychological barriers of the average citizens, and encourage them to participate into the community of makers. Now that we have the facility in place, it is all up to us whether we remain in the untapped population of the workforce, or we stand up and emerge as a creative citizen. The future depends on us.